Simplicity is often the key to creating a gorgeous hand-made card for someone special. This article aims to show you how to combine several elements to create a gorgeous feminine birthday card without cluttering your space. This card was made using Bazzil Christmas Cards 10 Pack, Francheville Pink Happy Birthday paper, Me and My Big Ideas Green Stripe paper, Pink Bazzil cardstock, pink ink pad, Alphabet stamps, Queen & Company Blooms Brads and Sandylion Birthday Presents & Balloons stickers. Select a dark green card for your background. I am using a pre-made card, but you can always make your own. 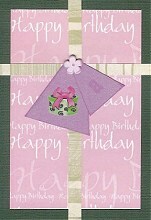 Cut a rectangle from your Francheville Pink Happy Birthday paper. It should be a little smaller than the front face of your card. Adhere in the centre of your card. Next, cut two strips of Me and My Big Ideas Green Stripe paper - one should be equal to the width of your card and the other equal to the length of your card. Both should be about 8mm wide. Position them on your card as shown above to create the effect of ribbon. You can use ribbon instead if you like. Now cut two tags from pink Bazzil cardstock. One should be bigger than the other. Ink the edges with a pink ink pad and allow to dry. Centre them on your card as shown in the picture above. The tops of the tags should overlap and should be positioned on top of the join between your two green stripe paper strips. All that's left is to add the final touches. Position a pink Queen & Company Blooms Brads brad in the centre at the top of your tags. Place a gift sticker from your sheet of Sandylion Birthday Presents & Balloons stickers in the centre of your large tag. Finally, stamp the first letter of your receiver's name in the centre of the small tag. And voila! You now have a gorgeous card for one of your loved ones.